This will be the final Once Upon A Time recipe that I’m sharing with you. I did make others, but not everything turned out nice enough to photograph the first time around so I’ll just have to make some of these again without the OUAT theme. The Seven Dwarves are a part of Once Upon A Time just as they are in the story of Snow White. In this version, you learn that there was actually an eighth dwarf that died an untimely death. You also find out that dwarves are hatched from eggs and do not know what love is. Their names are given to them when they first touch their pick axe. In the case of Grumpy, you find that their names can change. The dwarves make friends with Snow White when she is on the run from the evil queen and even give Prince Charming a hard time when he and Snow finally get together. In Storybrooke, the dwarves are basically handymen, skilled in just about everything from crops, mining and electricity. 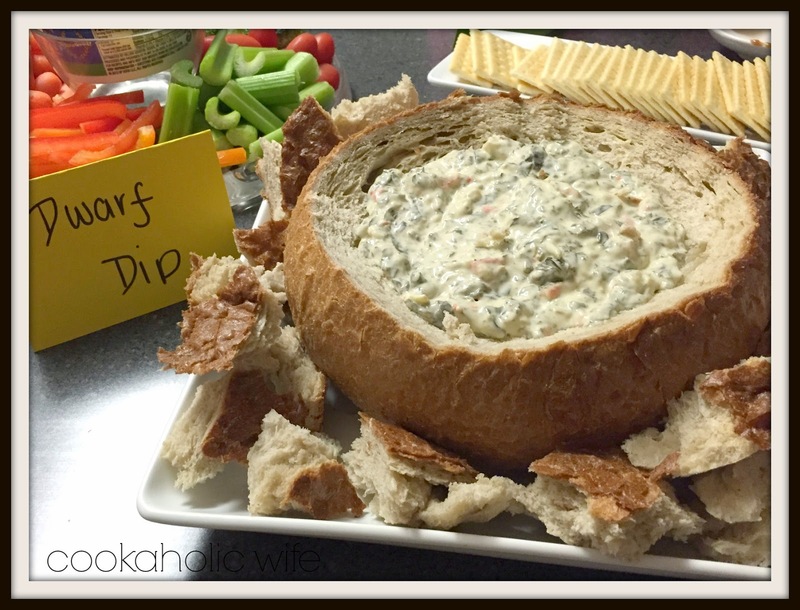 This dip really has nothing to do with dwarves, but since it’s a spinach dip I decided dwarves would eat spinach dip for strength, just like Popeye would. And since they are dwarves, who are kind of rustic, it would only make sense that they would eat their spinach dip in a pumpernickel bread bowl. 1. Thaw spinach and cook according to package directions. Drain excess water and let cool. 2. Whisk together sour cream, mayo and vegetable recipe mix in a large bowl until well combined, then stir in the cooked spinach. 3. Let dip cool for 2 hours. 4. Cut a large circle in the top of the bread bowl, leaving a 1-inch rim. Use a spoon to dig out the inside of the bowl so all of the dip will fit inside. Cut up or tear pieces of the scooped out bread to use for dipping. 5. Transfer the chilled spinach mix into the bread bowl and put on a plate with bread pieces and additional crackers or vegetables for dipping.